As most of you know, I am expecting my first baby in just a few weeks (edit: Baby has arrived, this is a pre-written and scheduled post)! While this has been an incredibly exciting time in my life, pregnancy has presented many challenges for skincare. Pregnant women can potentially have a host of skincare complaints and concerns with limited "safe" skincare treatment options. As a "Preggie", I have seen an overall increase in oiliness in my facial skin, an increased tendency to break out, an increase in dry patches and skin irritations on my body skin, itchy skin, increased tendency to "freckle", and a slight "pregnancy mask" on my upper cheeks. Not to mention leg swelling and cramping and trying to prevent varicose veins and stretch marks. Whew! Many of my favorite treatment products are just not usable during pregnancy. Preggies need to specifically avoid Salicylic Acid, Benzol Peroxide, and any form of Vitamin A or Retinol. Ya'll would really be surprised. Those ingredients are in *everything*! It is hard to find products without one of those listed as an active ingredient. Do you want to learn more about what to avoid? 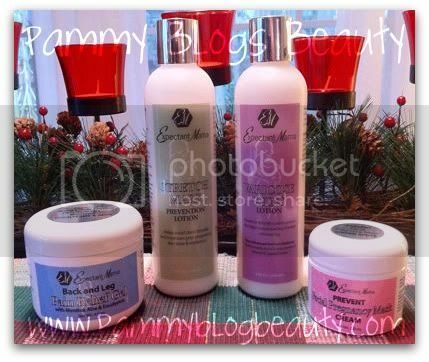 Check out my friend Christine's Skincare While Pregnant blog post. Plus, if you are like me as a Preggie, I am trying to go all-natural and organic as much as possible while pregnant. It just feels like the right thing to do: avoiding chemicals. So, as you can imagine, I was absolutely thrilled to find out that one of my favorite natural brands, Reviva Labs, just launched an entire skincare range, Expectant Mama, specifically for pregnant ladies! The timing could not be more perfect! I am using these products during the peak 3rd trimester of pregnancy. Would you like to hear more? Keep reading! The Reviva Labs skincare company is known for their innovative yet natural products. Their new Expectant Mama skincare line strives to bring results-based skincare to the pregnant woman. Products in this line include: Stretchmark Prevention Lotion, Varicose Veins Lotion, All Natural Anti-Itch Belly Butter, Facial "Pregnancy Mask" Cream, and Back & Leg Relief Gel. From what I understand, stretch marks can't really be prevented? Am I wrong, can they? I believe they are largely determined by your genetics. But, with that said, this stretch mark lotion does contain a "special" kind of elastin (which apparently is not found in most mass-market stretch mark prevention creams). So, there could be something extra here to set this lotion apart from the others. So, what is that special elastin all about? The elastin that Reviva Labs uses in the Expectant Mama skincare contains two amino acids apparently not found in most elastins: desmosine and isodesmosine. StretchMark Prevention Lotion helps avoid stretchmarks and improves post-pregnancy skin tone. Features: Lyophilized Elastin and special peptide & Exotic Butters and oils (cupuacu butter from the rainforest and tamanu oil from the South Pacific). This combination can reinforce the strechablility of elastic fibers and improve skin texture and tone. Tamanu oils is supposed to be particularly effective post-pregnancy. I applied this lotion to my belly area (and occasionally the whole torso) before getting dressed and after evening baths or showers. The directions state to use this daily in early pregnancy until 6 weeks after birth. Now, I have not used this throughout my entire pregnancy. But, I have used it for my entire 3rd trimester so far (and that is apparently when stretch marks tend to "surface"). The Lotion Itself: The texture of this lotion is completely non-greasy. It spreads nicely and absorbs quickly leaving no residue on the skin. Skin is left feeling moisturized and soft without any residual stickiness. The product has a slightly minty smell and feel. It feels slightly "cooling" going on. Very refreshing. Also, I love that this product is not sticky! You can get dressed right after applying without your clothes sticking to you. Before discovering pregnancy skincare lines like Expectant Mama and Belli, I was using gel cocoa butter on my stomach which was nice...but it made my clothes stick to my oiled belly (lol)! Results? Well, ladies, I am happy to report that at 37 weeks pregnant (knocking on wood), I do not have any stretch marks!!! Now, I don't know what I can exactly attribute that to. It could be genetics or it could be the skincare products. In all fairness, I have used 3 skincare products on my belly since becoming pregnant to prevent stretch marks What can I say? I product test for my blog, so I try many things! But, do know that I do lengthy tests with all skincare products. I used each of these for about 3 months: first part of 1st trimester: CVS brand Cocoa Butter Gel, end of 1st trimester-most of 2nd trimester: Belli Elasticity Oil, and end of 2nd trimester-most of 3rd trimester: Expectant Mama StretchMark Prevention Lotion. What would I use again? Next time I am pregnant, I am going to rotate using the Belli Oil and the Expectant Mama StretchMark Prevention Lotion. I will use the Expectant Mama Lotion during the day as it wears better under clothing. Like I said, it could have been genetics on my side as well. But, either way, you know that I will be using these products for prevention if I get pregnant again!!! Yikes! Who wants varicose veins! I must admit the threat of those in pregnancy has me working hard to stay active, to frequently elevate my legs, and to limit crossing my legs. But, can a lotion help too? That sure would be nice!!! This Varicose Veins Lotion by Expectant Mama does more than promise to prevent or diminish varicose veins, it also works to help combat pregnancy-related swelling of the ankles and lower legs. While I do not have any varicose veins, hopefully I am preventing them! What I do have is a moderate amount of ankle and leg swelling. Exercise and good hydration has kept the swelling pretty well under control throughout the pregnancy. But, intermittently I have gotten swelling in the evenings (particularly in my ankles). Now that I am in my 9th and final month, the swelling has really increased. While I don't think that this lotion can fully combat the swelling, I can tell you that massaging it into my legs (or even better: having my husband massage this lotion into my legs), is a highlight of my evenings. It is a real treat to massage this into my tired and achy legs. From Reviva Labs: Help prevent varicose veins or diminish current varicose. Combines high-potency horse chestnut, bioflavanoids, Vitamin K, and special herbs in exclusive blending. This advanced formula improves circulation, strengthens vein walls, and relieves congestion. Also helps combat swelling of ankles and lower leg. The directions are to massage into legs before bedtime and in the morning from early pregnancy until 4 weeks post delivery. I have been using this from the end of my 2nd trimester through most of my 3rd trimester. I apply in the mornings after a shower. Also, I massage into my legs and ankles in the evenings when they are swollen or after a bath. The Lotion Itself: The lotion is a non-scented, non-greasy, and fast absorbing lotion. It feels nice going on my skin and it leaves my dry and temperamental skin nicely moisturized. Results? I have no varicose veins (crossing fingers!!!). But, I do experience swelling. I find that this is a nice product to use for leg massage to combat swelling. I will continue to use throughout the rest of my pregnancy and in future pregnancies. Price: $37.00 for 8 fl oz. This is a very thick and rich lotion or "body butter" specifically designed for the belly area (apparently the StretchMark Prevention lotion can be used on a larger area). Not only does it have the high-potency elastin and peptide and oil/butter mix that fights stretch marks, but also an herbal mixture with menthol that fights the itchiness that tends to go with a growing belly. As a pregnant woman myself (with a tired and over-worked brain), I find it great that I can confidently grab a product from this skincare line knowing that it is both safe to use in pregnancy and effective. There is no question that I will continue to use these products for the rest of my pregnancy. Also, I plan on using them when I become pregnant again. Us preggies need to treat ourselves with great skincare that works! From Reviva: Expectant Mama's Belly Butter brings the latest advances for not only avoiding strechmarks but also newly discovered emollients like tamanu oil and muru muru butter that do som much to help improve post-pregnancy skin texture. Directions: Massage lightly with upward movements in belly area. How I use: I apply this belly butter in the evenings right before I go to sleep. I keep it right on my nightstand. Applying this belly butter in the evenings has become a fun ritual as that is the time that my baby girl is most active in my belly. Plus, my belly skin has been rather itchy through pregnancy and I find this thick and rich belly butter to feel very soothing. The Product Itself: This butter-like cream is very thick and rich and has a nice smooth feel. The cream has a very light and pleasant menthol smell (not overpowering at all). The Belly Butter feels cooling going on and has immediate effect on any itching. 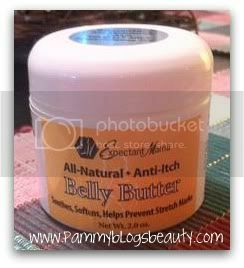 Actually, I have been grabbing this Belly Butter and applying throughout the day when my belly itches. This Belly Butter is non-greasy, so it does not stick to your clothing. Results: As I mentioned in the StretchMark Prevention Lotion review above, I do not have any stretch marks (yay!). So, I will continue to use for the rest of pregnancy and in future pregnancies for sure! Since this review has grown rather lengthy, I will continue this review with a "part 2". Part 2 will cover the "treatment" related products: Back and Leg Pain Relief Gel and the Prevent Facial "Pregnancy Mask" Cream. Stay tuned for that upcoming blog post!!! it's weird, because my ob/gyn said it was alright for me to use any of the over the counter acne products (he did not mention do not use anything with salicylic acid in it or benzoyl peroxide) he just mentioned i could not use my retin-a creams and those prescribed meds (only the antibiotic ones like clindamycin).. he's an overall amazing doctor, so i'm like hmm? so now i'm so confused! lol.. but this pregnancy is definitely creating some havoc with my skin! i'm definitely going to look into this brand! thank you for your review!